Our railway cleaning cabinets supply hot and cold water, distribute detergents and have a reservoir for used water. LaborexRail cleaning cabinets are made out of stainless steel AISI 304 and are designed for heavy duty use. All material are the most resistant towards extreme climate conditions. The cleaning cabinet has separate doors for clean water and used water. The complete cleaning cabinet is insulated to prevent freezing at extreme temperatures. 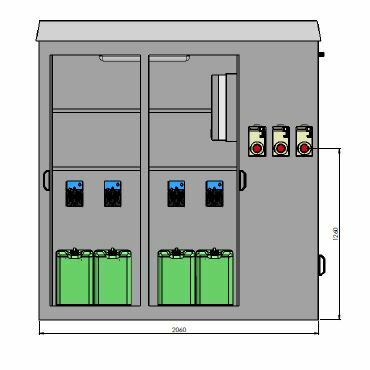 Our railway cleaning cabinets hold all controls, heating radiator, basin, valves for hot and cold water, distribution of detergents and used water reservoirs. Compartment A is executed with a central lockable door. The hot water will be delivered through the central piping system out of the vacuum pumps cooling tank. 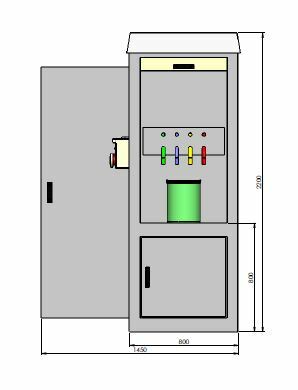 Automatic detergent distributors through three dosing pump. Max. flow 20 L/hour, flow fully adjustable in order with the desired detergent concentration. Compartment for stocking three drums of 5 L. detergent. Compartment B is the drainage collecting compartment. 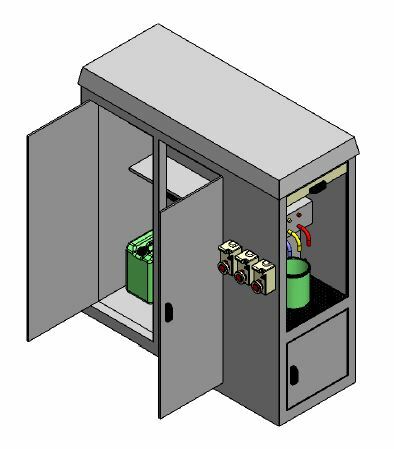 This compartment is executed with a central lockable door. Integrated used water tank with level control. Automatic drainage throughout the vacuum wastewater suction line.